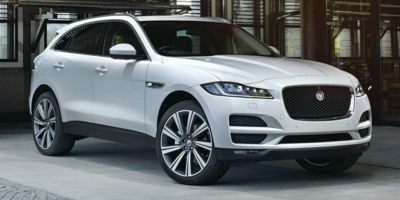 The Jaguar F-Pace is available with one of five different engines, three of which give the Jaguar excellent acceleration and two of which provide the Jaguar with surprising fuel economy. For those looking to save on gasoline, the F-Pace is available with a 2.0L turbocharged 4-cylinder diesel engine. Like most diesel engines, it combines a somewhat middling power output with a torque figure that may cause a double take. Horsepower is rated at 180, while torque is rated at 317 lb-ft. The base gasoline engine is a 2.0L turbo 4 cylinder, rated at 247 horsepower, with power sent to all four wheels. Acceleration with this engine is on par with others in its class, with 60 mph achieved in a claimed 6.4 seconds. For some though, that won't be enough and for those buyers, Jaguar offers a more powerful version of their 3.0L Supercharged V6 making 380 horsepower. 0-60 mph comes up in 5.1 seconds for the more powerful Jaguar F-Pace. At the very top of the lineup sits a supercharged 5.0L V8 engine making 550 horsepower. All engines available on the F-Pace send power to all-four wheels via an 8-speed automatic gearbox. The Jaguar F-Pace is available in seven different trims, base F-Pace, Premium, Prestige, R-Sport, S, Portfolio and SVR. The Portfolio trim includes an interactive driver display, 20-inch alloy wheels, 20-way electric power seats trimmed in Windsor leather up front with heating and cooling, a heads-up display, a powered, gesture controlled tailgate, an 825 watt meridian sound system and four-zone climate control. The F-Pace S includes its own unique body kit and red painted brake calipers, along with most of the kit that comes standard on the R-Sport. However, it also includes adaptive suspension to further improve handling. The biggest news for the F-Pace is the introduction of a high-performance model. Dubbed the SVR, the new top trim level features a powerful supercharged V8 engine and 550 horsepower. With that much power, Jaguar claims the new F-Pace SVR will hit 60 mph in just 4.1 seconds. Other changes for 2019 include a new 10-inch touchscreen as well as a few extra safety and driver assistance features. The F-Pace slots into Jaguar's lineup above their entry-level XE, but below the mid-sized XF. With a base price of about $43,000, the F-Pace presents a strong value, especially considering its combination of sporty styling and excellent performance. A Porsche Macan is over $14,000 more expensive to start and while a BMW X3 is somewhat cheaper, it doesn't have nearly the presence that the F-pace has, even in its base configuration.